~ Are you seeing what I'm seeing? 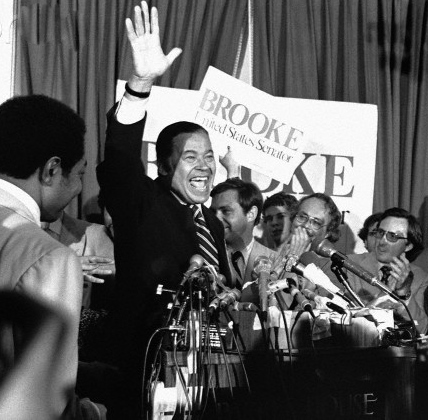 Today marks the forty-eighth anniversary of Edward Brooke’s election to the United States Senate. I don’t think the significance of Brooke is lost on anyone of any party: the first African-American elected to Senate by popular vote, the only African-American elected to a second term and, until 1993 the only one to serve in the twentieth century. By lately, when his name his invoked, it’s about the other distinction. Brooke was the last Republican senator elected from Massachusetts, before Scott Brown. His, is the brand of Republicanism Scott Brown or Charlie Baker needed to market: proof that “compassionate conservative” is not an oxymoron. At ninety-five, Brooke is a final link to the era when the Mass Republican Party produced national leaders. Brooke, Elliot Richardson, Leverett Saltonstall, Francis Sargent and Henry Cabot Lodge Jr. easily commanded network coverage and frequently influenced foreign and domestic policy. Before John Kerry’s unlikely election the Senate, Saltonstall and Brooke kept the seat Republican for forty years. It was, in fact, the Republicans who handed Lt. Governor Kerry a golden opportunity by rejecting the national prominent, well funded statesman Elliot Richardson for right-winger Ray Shamie in the ’84 primary. But, beyond geography, there is simply no demonstrable connection between those Republicans and their modern counterparts. And the difference goes well beyond legislative priorities. Of course Brooke’s landmark legislation, the Fair Housing Act, expanding Title IX protection to girls and women and tightening the Voting Rights Act, would be inconceivable in today’s GOP. But his vision for the party was different. He refused to cast those in need as the enemy. For him, poor people are not the ones defrauding our government. The safety net is not what’s bankrupting us; further disenfranchisement couldn’t possibly be the answer. He vigorously opposed Nixon’s Southern Strategy, to marginalize minorities in exchange for the white Southern vote. He believed that Republican ideas could win on merit, not tactics. After all, he’d done it, beating a popular Democratic governor by half a million votes and winning a second term by six hundred thousand. He warned his party not politicize the Supreme Court, that it would only compromise the Court’s independence and the Party’s integrity. They didn’t listen. So, when Nixon attempted to deliver a key campaign promise– reversing the direction of Warren Court–Senator Brooke chose conscience over loyalty. He voted against the confirmations for G. Harrold Carswell and Clement Haynsworth to the High Court and both were defeated. In 2007, Brooke told NPR that Nixon was neither conservative nor liberal, but a pragmatist. Nixon, he said, liked power and knew how to get it. It would be hard to imagine any circumstance in which the modern Republican party could be described as pragmatic. Nixon’s formula for winning, has since become the dogma that leaves little room for dialogue and no room for compromise. Today’s Republicans seemed to have lost any ability to self-regulate. One, of the many, great things you could say about Edward W. Brooke III, Republican from Massachusetts is… he saw it coming.